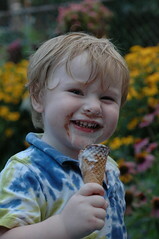 I couldn’t resist sharing one last summer pic of B enjoying his King Cone…May we all go into the weekend in such a happy way! That’s a good enough way to spend the weekend to me! Have a great one!